So much hot money was sloshing around Miami that the Mutiny, the favourite waterfront haunt of gangsters, celebrities and politicians, was selling more bottles of Dom Perignon than any other establishment on the planet. 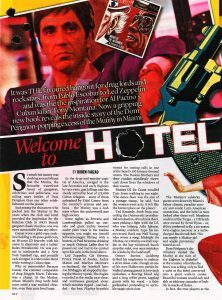 And among the characters who packed into the Mutiny in the years the club and hotel provided the inspiration for the Babylon Club in 1983’s bloody gangster classic Scarface, one was more memorable than any other. Caesar wore a gold-rope necklace holding a 50-peso gold coin, an 18-carat ID bracelet with his name in diamonds and a ladies Rolex Presidential. He was partial to turtlenecks and a New York baseball cap, and proudly rode shotgun in a Mercedes-Benz while waving a Cuban Cigar.